If you read my last article on PostCSS, I hope that you don’t get the feeling that I don’t like that tool. Quite on the contrary! I love it. I use it on a daily basis for all my projects. This led me to the conclusion of the problem that was itching my brain: I just don’t like the term post-processor. And if I think about it, I don’t like preprocessing either. How does the world look like now that we’ve a dedicated tool for post-processing? Suddenly we can do so much more on the right side of our toolchain. The same tool we use for Autoprefixer, fallbacks and other optimisations can help with all the crafting. 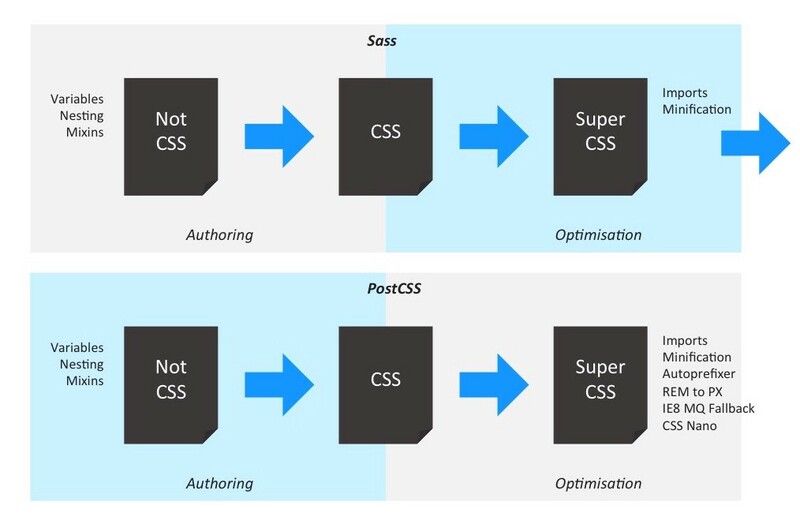 If you take it seriously, the use of CSS variables — even with it being backed by the spec — is pre-processing. None of the code that you write is going to end up in the browser. So how do they differ from the simple variables Sass has to offer? Other than having a fancier syntax, they don’t. I think this was Hugo’s original point. In this sense, Sass is actually very conservative. Extending CSS syntax is prone to confusion not at all future friendly.